Are you growing your business from the inside out? You’re a business owner, so naturally one of your primary concerns is attracting new customers. Marketing strategies are critical for growth and that’s where Affordable Image will go to work for you. As a marketing agency, we help you develop the tools you need to reach out and get new people through your doors. Our entire business is built on the fact that marketing efforts are a vital investment. They grow your business from the outside in. But are you growing from the inside out? We excel at helping you develop and grow your brand. We can build you a fantastic website, manage your digital presence, create your sales-funnels, generate social media buzz, build your direct mail campaigns and manage your SEO. We can help you optimize your brand to convert Google searches into initial contact with your office. Employing a combination of the above “marketing tool kit” strategies is designed to accomplish one mission, get your phone ringing and send people through your door, but then what? Bottom line, those customers are real people, craving a genuine connection with whom they do business. And who creates that meaningful connection with your customer? Your team. Your team is the heartbeat of all your marketing endeavors. They make your brand come to life for your customer. You can get 100 people to contact your business per week, but if they don’t feel important, valued, heard and cared for by your team, those same 100 people will move on to the next business on their Google search page. In most businesses, the first connection for the customer is with your team and not you. And they typically have more face-time to either make or break those relationships. For these reasons, your investment in them is vital to your overall success and to the ROI on every marketing move you make. So, are you growing from the inside out? Are you investing in your people while simultaneously investing in attracting new customers? Investing in them means really getting to know the individuals on your team and helping them grow professionally. Sometimes it also means helping them move on to a culture more suited for them. 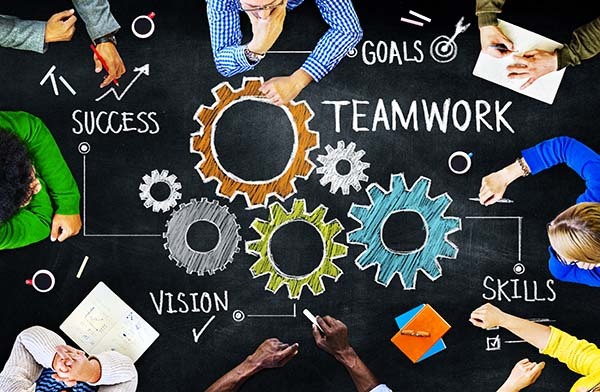 Just like your customer is looking for that genuine connection with your team, your team desires the same connection with you, with each other and to the overall vision of your business. We as human beings want to know we are contributing to something bigger than ourselves. We want to make a difference. We want to feel that the work we do is meaningful and valued. When we feel those things, we grow and reach higher. We are inspired to stretch beyond mediocrity. We invent, we innovate. We feel fulfilled and we have the necessary free heart space to make those meaningful connections with the people we serve. It’s easy to let entrepreneurial tunnel vision blind you to the human condition of your team. And before you know it, you’re only seeing a manager and not Brenda. The reality is though, Brenda doesn’t stop being Brenda when she sits down at her desk. Each person is not merely a skill set. Are you taking the time to get to know each member of your team beyond their title and job description? Do you have constant and consistent communication with each team member individually? Do you truly listen to their ideas, goals and dreams? Are you taking the time to understand what motivates them, what makes them feel appreciated, and to the contrary what deflates or discourages them? Much like parenting, what works for one child does not work for the other. Great leaders adjust and adapt to the unique personalities of those they lead. By getting to know your team, it will inspire them to do the same for your customers. As the saying goes, “nothing changes if nothing changes”. It’s unrealistic as business owners to expect our team to work diligently to grow the business if they themselves are not growing. There is always more to learn no matter what position they hold. Learning inspires thinking. Inspired thinking leads to new ideas and improvements to systems. There’s a reason doctors are required to have continual education, because it leads to better patient care. Your team is no different. Being intentional about your teams’ continuing education is, therefore, an investment in better service to your customer. Ok, so the hard truth is you could spend time getting to know a team member and invest in their growth and at the end of the day, you could still have an employee who is not delivering the outcomes your business needs. It’s easy to get caught in the trap of feeling like it’s less painful to work with what you’ve got than to go through the labor and time intensive process of finding a new employee. And as hard as it is to let an employee go, it is important to know when that time comes. In fact, many business owners often say after replacing a mediocre employee “I should have let so-and-so go sooner than I did”. That being said, some employees are worth an extra investment. Theodore Roosevelt said, “People don’t care how much you know, until they know how much you care.” It’s a great barometer to use when trying to decide if you should keep or weed out an employee. Do they truly care? After all, you can teach people a multitude of skills but it’s extremely difficult to teach someone to care. Caring employees take personal responsibility. They are teachable. They show a willingness to get better, be better. They fit your overall culture. Those are the people deserving of your patience. As a marketing agency, our service to our clients is creating opportunities for people to meet you and your team. Your team creates the connection that causes them to stay. Your success is dependent upon both opportunities and connections. We’re here to help grow your business from the outside in. You’ll get the biggest return on your marketing dollars when you’re also growing from the inside out. Do you know how your team is doing at making WOW factor connections with the leads from your marketing ventures? If not, we can help. Our call monitoring service allows you to hear how each incoming call is being handled by your team. It allows you to identify areas where additional training might be needed for individual team members. Give us a call today at 800.639.1622 so we can ensure your marketing dollars have the greatest potential for growth.